The Kwikset Kevo is one of the most popular smart locks on the market, but if you’re a stickler for keypads, the Schlage Connect is an option to consider. 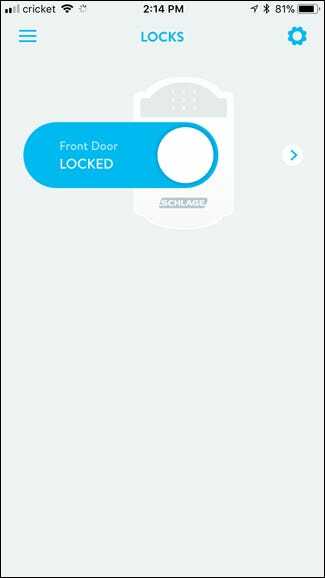 Here’s how to install and set up the Schlage Connect smart lock. 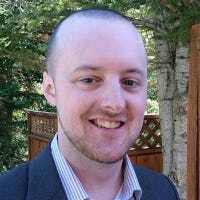 RELATED: Are Smart Locks Secure? The Connect isn’t an add-on to your existing deadbolt, but rather a full replacement. This can make the installation process a bit daunting for those who’ve never replaced a lock before. So before you get started, make sure that this is something you’re comfortable doing. If not, it may be wise to call a knowledgeable friend (or a professional locksmith) to help. This guide also assumes that you already have a deadbolt installed on your door. If you don’t, then you’ll need to drill a completely new hole in your door to install the Kevo (or any deadbolt for that matter) using one of these. Luckily, the Schlage Connect comes with everything that you’ll need, but you’ll need a couple of tools to put it all together: a screwdriver or power drill, and maybe a hammer. If you do decide to use a power drill, be extra careful not to over-tighten any screws. Start by removing the deadbolt that’s currently installed on your door, which usually involves removing a couple of screws from the inside. My deadbolt is of the battery-powered keypad variety, so it’s a bit more complex to remove. If you just have a simple deadbolt, this process should be a lot easier for you. After those screws are removed, carefully take off the cover. You may have to slightly tap on it with a hammer to loosen it up if it doesn’t come off easily. There will be two more screws on the inside that you’ll need to remove. These connect the inside portion of the lock to the outside portion. Once those screws are removed, you can carefully pull apart the entire lock and remove it, starting with the interior section. From there, remove the outside portion. Next, remove the two screws on the latch. Pull the latch out of the door. You now have a clean slate to install the Schlage Connect smart lock. The first step is to install the latch. Depending on the mortise of your door, there are different faceplates you can use, including a square faceplate, a rounded faceplate, and one without a faceplate at all. Take a look at your previous door latch and match it with the new one to see which one you need to use. Insert the door latch into the door. Make sure that the middle hole in the door latch is centered within the door’s hole. If not, remove the latch, hold onto the deadbolt latch and rotate the mechanism 180 degrees to change the position of the middle hole. Re-insert the latch, making sure the “TOP” marking on the latch is facing upward. Next, find the screws that have different threading (there will be four of them included, but you only need two). Use these two screws to secure the door latch onto the door. Next, slide the keypad portion of the lock onto the outside part of the door. Make sure that the cable feeds through the door hole and that the sticking out lines up and slides into the middle hole of the door latch. Then take the support plate and place it on the inside part of the door, making sure that the side that reads “Against Door” is placed…well…against the door. When you do this, feed the cable through from the other side and line up the bolt holes. Next, take the two long bolts included with the lock (the non-pointy ones) and screw the support plate into place. After that, grab the inside assembly and remove the battery cover. At this point, you’ll also want to jot down the “Programming Code” and “User Codes” that are printed on the back of the assembly. You can change these in the future, but you’ll need them initially after installing the lock. After you write those down, hold the assembly up to the lock and plug the cable into the back of it. Route the cable into the grooves. Slide the assembly over the support plate, making sure that the table sticking through lines up with the knob and push it all the way on. Take the long black bolt and secure the inside assembly to the support plate. Then take the really tiny screw and secure the upper portion. Once that’s complete, remove the battery tray by sliding it up and out of the assembly. Insert the four AA batteries that came included with the lock. Slide the battery tray back into the assembly and connect the battery connector to the battery tray. After that, place the battery cover back on. Next, it’s time to test out the lock and see if it works. Start by opening up the door (keeping it unlocked) and press on the “Schlage” button at the top of the keypad. The keypad should light up. From there, enter in one of the user codes. If successful, the deadbolt will extend and retract. The lock should now be ready to go for manual usage. While you can perform all sorts of functions on the lock itself (like adding new codes, changing codes, etc. ), the big kicker for this lock is the ability to control and manage it from your smartphone by connecting it to a Z-Wave smarthome hub. How you do this is completely dependent on what type of smarthome hub you have, but the process should be mostly the same all around. In my case, I’m going to connect the lock to my Wink hub. To do this, you’ll first need to open up your smarthome hub app and navigate to where you add a device to the hub to put it in search mode. Next, open your door, extend the deadbolt out so that it’s in the locked position, and then press the Schlage button followed by your programming code plus “0”. The orange dot will blink and after a few seconds the green check mark should light up, which indicates that connection was successful. 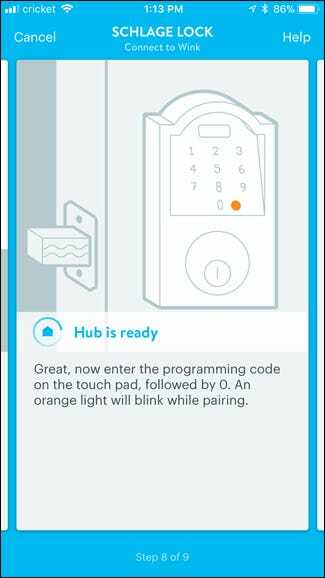 Once the lock has connected to the smarthome hub, you can begin controlling it from the hub’s app and do things like lock and unlock remotely, change user codes, and more. 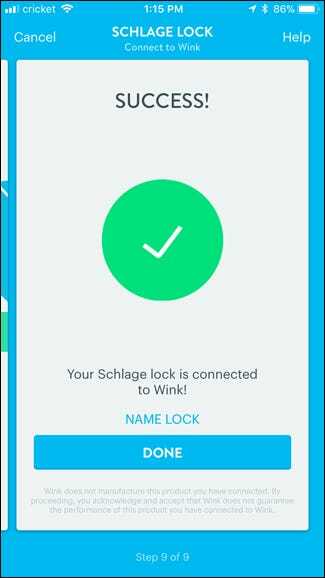 Again, you can always manage the lock’s functionality using the lock itself without the need to connect it to a smarthome hub, but with the Schlage Connect, you’re essentially paying for the smarthome capabilities, so it would be beneficial to take advantage of it.